Welcome to this quarter's edition of the Safety Compass. We have once again compiled an issue packed with useful information on tools and success stories to help the safety community build effective highway safety programs. I continue to encourage all of you to submit information on your success stories and experiences, to help all of us improve our safety programs and reduce crashes and fatalities. Our feature story this issue recognizes the success experienced by Missouri in that State's efforts to reduce highway fatalities. As you know, making significant improvements in highway safety is no easy task. But Missouri's approach - which combines setting an aggressive goal, leadership commitment, and implementation of a comprehensive set of safety improvements and countermeasures - resulted in the achievement of their fatality reduction goal a full year ahead of a schedule that some said couldn't be met. Missouri's approach can be used successfully in other States and localities. I encourage you to read about this impressive success story and think about how to achieve similar success wherever you work. This issue also includes stories on work zone safety, consideration of safety in the planning process, cable median barrier, road safety audits, and reducing alcohol involved fatalities, in addition to our regular features. As always, please share the Safety Compass with others in your organization and let us know if you have any suggestions for improving its content and format. Likewise, if you have thoughts about actions the FHWA Office of Safety can take to support your efforts to improve highway safety, please share those as well. Saving lives and reducing injuries from trafﬁc crashes is why Missouri safety advocates from around the State have formed the Missouri Coalition for Roadway Safety – and their efforts are having amazing results. For the second year in a row, more precious lives were saved from Missouri trafﬁc crashes than in previous years. This latest decrease rang in 2008. Fatalities from traffic crashes in Missouri dropped dramatically from 1,257 in 2005, to 1,096 in 2006 (the largest drop in traffic-related fatalities in 2006 of any State in the nation), and fi nally to 977 in 2007. Although the 2007 number will rise as additional reports come in, it is expected to stay under 1,000. Missouri traffic fatalities haven’t been that low since 1993, when the fatality total for 1993 was 949. This is almost a 24 percent reduction in the last two years. Striping and refl ective markings to help keep drivers on the road. “We will continue to look for innovative ways to make our roads safer and to spread safety messages,” Rahn said. Over the last four years, Interstate 70 cable installation reduced crossmedian fatalities from 24 to two. Statewide, these fatalities were reduced by nearly half. 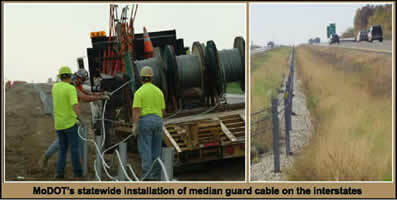 Missouri currently has nearly 500 miles of median guard cable installed. MoDOT is studying the State’s entire four-lane divided highway system to determine additional locations where guard cable would be effective in reducing fatalities.“We are very pleased with Missouri’s decrease in fatal traffic crashes, and we are committed to working with our traffic safety partners to further reduce the number of traffic deaths in our state,” Keathley said. The patrol and other local law enforcement agencies used innovative enforcement efforts and safety programs to help reduce the number and severity of traffic crashes in Missouri last year. The coalition continues to work toward the passage of a primary seat belt law in Missouri, which would save an additional 90 lives each year. The coalition is made up of Federal, State and local offi cials. In 2004, the group created Missouri’s Blueprint for Safer Roadways, which outlines eight essential strategies to reduce fatal and serious injuries from traffic crashes. "Our Work is Saving Lives"
For more information about the coalition, Missouri’s Blueprint for Safer Highways, or how to Arrive Alive, visit www.saveMOlives.com. For more information about Missouri’s traffic safety efforts, please contact: John Miller, MoDOT traffic safety engineer at (573) 751-5678, or Leanna Depue, MoDOT’s director of Highway Safety at (573) 751-0599.You can also contact: Don Neumann, FHWA, at (573) 638-2607. In 1999, the South Carolina Department of Transportation (SC DOT) ambitiously contracted to complete 27 years of highway construction in a seven-year period, quadrupling construction with an anticipated resulting increase in work zone crashes, injuries and fatalities. Statistically, the impact of the accelerated construction schedule realized a 30% increase in work zone crashes between 2001 and 2002. Injuries increased by 23.7%, clearly demonstrating a need for a focused, ongoing approach to reducing work zone incidents. 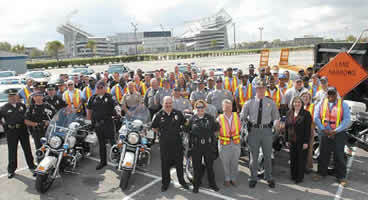 In response, SC DOT implemented an extensive Work Zone Safety program from 2002 through 2005 that included statewide public information and education campaigns, retreats, teleconferences, a statewide tour of the National Work Zone Memorial, worker training, presentations and an aggressive High Visibility Enforcement Program. SC DOT partnered with FHWA, the State’s Department of Public Safety, local law enforcement agencies, highway contractors, and other governmental organizations using Federal funding to implement massive informational campaigns conveying a zero tolerance message for speeding in work zones. Extensive training was also provided for highway workers to improve consistency in work zone operations. While the goal was to reduce work zone crashes and fatalities by a minimum of 7%, the program far exceeded expectations, with reductions in crashes dropping 39.2% over one control period, injuries reduced by 44.1% and fatalities reduced by 50%. In 2005, the Ohio Department of Transportation (ODOT) began to integrate safety data and needs into the Metropolitan Planning Organization (MPO) planning process. The agency has now conducted safety workshops with all of Ohio’s 17 MPOs and is working with local representatives to develop annual safety work plans based on crash analysis and public input. This program is signifi cant since roughly 57 percent of fatal crashes and 45 percent of incapacitating injuries occur within Ohio’s cities each year. To date, fi ve MPOs have developed work plans and have received funding assistance to make improvements on local roads using the 4Es: engineering, education, enforcement and emergency medical services. The remaining MPOs have plans in the development process. The fi nal work plans become part of the MPO planning process and are reviewed annually to evaluate the effectiveness of improvements in reducing crashes and to determine if new locations should be considered for review and improvement. Through an analysis of the State’s crash data, Missouri Department of Transportation recognized an emerging problem of severe crossmedian crashes on its most heavily traveled roadways. To address this safety concern, Missouri began an effort to install median cable barriers system-wide on its major interstates. The key to the success of this system-wide improvement was the installation of low-cost safety devices across the entire system - even at locations without a history of severe crashes. Cable barrier has performed successfully in Missouri, catching over 95% of vehicles entering the median. Most importantly, it is saving lives. As an example, Interstate 70 suffered 24 crossmedian fatalities in 2002. The installattable to the State’s system-wide approach to this safety problem. With Arizona’s many road owners, the building of partnerships and agencies working together to address roadway safety is an essential component to reducing fatalities and serious injuries. The Road Safety Assessment (RSA) is a safety tool that Arizona identifies as useful, and RSAs are identified as an implementation strategy in the Arizona Strategic Highway Safety Plan (SHSP). The statewide RSA Program was initiated and a RSA Program Manager hired. 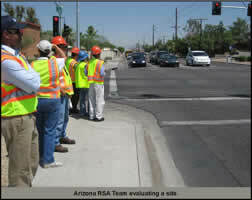 The RSA Program is housed within the Arizona Department of Transportation’s (ADOT) Highway Enhancements for Safety (HES) Section, and it is a resource available not only to ADOT but also to all local, county, tribal, and federal agencies in the State to help improve traffic safety for all road users. Much progress has been made since the inception of the Arizona RSA Program. The Arizona RSA process closely follows the FHWA RSA guidelines. The RSA is initiated by a request from a road owner through the submission of a one-page application describing the location to be considered for an RSA. The RSA is usually conducted within two to three months after receiving the application. Team members are identified and recruited by the RSA Program Manager. The team typically consists of four to six members from various agencies and disciplines. The RSA team spends two full days on site conducting day and night field reviews, analyzing data, identifying safety issues and developing recommendations. This is followed by a presentation, team recommendations, and a written report of the RSA submitted to the road owner agency. One month after receipt of the report, the road owner agency submits a response letter to the RSA Manager describing what action will be taken to address the RSA findings. The Arizona RSA Program has developed a resource pool (peer to peer program) to use for team participation. The resource pool participants are from engineering, enforcement, education, and health services, and come from various levels of government and private agencies, including FHWA, Bureau of Indian Affairs, US Forest Service, Arizona DOT, Department of Public Safety, Department of Health Services, various counties and cities, AAA, COGs/MPOs, TTAP, academia, and consultants. Agencies that have an RSA conducted by the RSA Program are encouraged to participate on future RSAs for other agencies. The resource pool currently has 68 names of potential team members. The RSA Program is a resource available not only to ADOT but also to all local, county, tribal, and federal agencies in the State to help improve traffic safety. Since its inception the RSA Program has conducted 15 RSAs, made 26 presentations, and conducted 8 workshops. The 15 RSAs were conducted on city, county, state, tribal, and BIA roads. The RSA team members included engineering, enforcement, and education representatives from various city, county, state, and federal agencies and consultants. Arizona is one of the first States to have a statewide RSA Program available to all road owner agencies. Conducting RSAs for local and tribal agencies has provided an excellent opportunity for sharing best practices to address the safety concerns such as run-off-theroad, intersection and pedestrian crashes, as well as improving driver behavior. 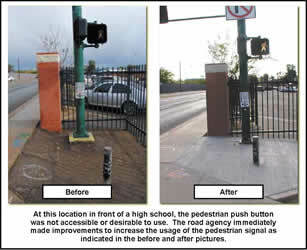 Countermeasures that have been implemented based on RSA recommendations include: development of a scoping project; installation of delineators and raised pavement markers; installation of warning signs and object markers; removal of unnecessary signs; signal timing adjustments; and relocation of pedestrian signal push buttons. The level of interest in the RSA Program has increased throughout the year. RSA presentations were made at 26 conferences and meetings to provide information on RSAs and the RSA Program, and to highlight good and bad safety practices. Eight RSA workshops were conducted with technical assistance from FHWA and logistical assistance from Arizona Local Technical Assistance Program (LTAP). Agencies participating in the workshops included city, county, state, tribal, federal, international, enforcement, transit, health services, and consultants with over 130 participants. In addition to workshops focused on Arizona agencies, the following national/international focused workshops were also conducted: US Forest Service as part of its “Motorized Mixed Use Analysis Training” for Forest Service engineers, and FHWA for US and Mexico agencies at the Mariposa Port of Entry (with simultaneous Spanish translation). A positive outcome of the RSA presentations and workshops is the increase in traffic safety awareness by decision makers and road agency staff. The requests for RSAs received by the RSA Program Manager refl ect an improved understanding of the traffic safety problem plus an interest by agencies to identify and implement countermeasures to make Arizona roads safer. Information regarding the Arizona RSA Program was shared during the National RSA Peer Exchange, during which it was highlighted that Arizona is one of the fi rst States to have a statewide RSA Program available to all road owner agencies. For additional information on the Arizona RSA program, please contact Mike Blankenship, Arizona RSA Program Manager at: mblankenship@azdot.gov. Big Sky Country -Montanarecently unveiled another tool to reduce the devastating effects of impaired driving on its highway safety record. 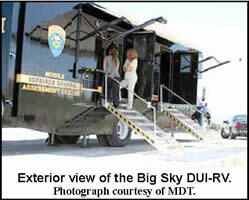 The Montana Highway Patrol will be deploying a mobile Driving Under the Influence (DUI) processing center this summer at major events across the State. The mobile processing center is like a custom recreational vehicle and is designed for highway patrol officers on dedicated patrol for highway users suspected of driving under the influence of alcohol. Funded through the Montana Department of Transportation’s (MDT) Highway Safety (Section 402) Program, the mobile processing center will be staffed by two officers when deployed. Drunken driving suspects will be tested at the center. The vehicle has its own testing station, an Intoxilyzer 8000, refrigeration for storing blood evidence and equipment to perform background checks. By bringing the mobile processing center to major events, field offi cers can quickly process suspects and return to the field for additional enforcement. Montana’s strategic highway safety plan identified reducing alcohol-related traffic fatalities and injuries as a major emphasis area. The purchase of the mobile center is an essential strategy for more efficient and effective enforcement of alcohol-impaired driving. Finite element analysis (FEA), coupled with the use of high-speed computers, is a new and innovative method for developing crashworthy roadside safety structures. This approach is useful for studying crash events and evaluating alternative designs for roadside safety structures. Finite element analysis is an extremely effi cient and costeffective tool for the design of safer highway guardrails, bridge supports, signposts, and other roadside structures. FEA involves the use of detailed computer models of vehicles and roadside hardware in a simulation mode to replicate a crash event by tracing the contacts of elements and their deformations over small increments of time. The Federal Highway Administration (FHWA) initiated the Centers of Excellence for Finite Element Crash Analysis in 1991 to promote the use of this analysis technique and enhance the knowledge and skill of persons actively applying this emerging technology. The Centers have met periodically to share experiences and learn about new developments in this field. 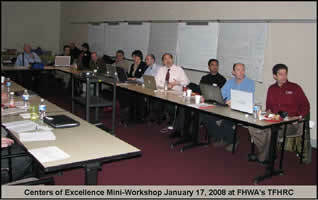 A mini-workshop was held January 17, 2008 at the FHWA’s Turner-Fairbank Highway Research (TFHRC) to allow 21 persons, including several from abroad, to participate in a discussion of important FEA topics and issues. The participants represented 9 different organizations actively involved in various applications of FEA. Four presentations provided status reports on advanced crash analysis efforts. Dr, Anghileri of the Politechna of Milano described their work to establish requirements for the use of simulation results to qualify safety barriers for regulatory acceptance in Europe. He presented data from a series of similar tests repeated to capture data for the comparison of test results. He outlined the proposed requirements and a plan for round robin tests at facilities across Europe. These efforts are of great interest to the US as we move towards establishing similar requirements. Drs. Plaxico and Miehle of the Battelle Memorial Institute described their efforts to enhance an FE model of a tractor-trailer truck and to validate it. Their efforts have focused on enhancing the suspension and steering components of the vehicle model, updating the material properties for some elements to improve the comparisons test data, and creating variations of the model. The variations will provide models that refl ect some of the different types of tractors and trailers currently on the road. For example, day cab and sleeper cab versions have been created and trailers of different lengths (40 to 53 foot) have been modeled. Part of this was motivated by the FE community’s interest in comparing model results to the few full scale crash tests that have been conducted for validation purposes. Drs. Marzougui and Kan of George Washington University described efforts underway at the National Crash Analysis Center (NCAC) to develop new vehicle models. They described the efforts begun last March to reverse engineer a 2007 Chevy Silverado Quad Cab pickup truck. The NCAC conducted a series of non-destructive tests of this vehicle to capture various inertial and suspension response data for subsequent validation of the model. They noted that the reverse engineering process utilized a laser scanning device to capture the precise geometry of the vehicle’s parts. This has allowed the process to be completed faster than ever before. It was noted that the validated model is expected to be released in May 2008. Dr. Ray of Worchester Polytechnic Institute described efforts that he is leading to recommend standards for verifi cation and validation of FE models under an NCHRP project. He noted that comparison measures have been identified, and an approach based upon a Potential Importance Ranking Table (PIRT) for each model is being formulated. The PIRT table would identify the various components and order them based upon consensus of their importance to the application of the model. He noted that he would be working with the roadside safety community to solicit feedback on their recommendations over the next two years. These presentations set the stage for lively discussions future vehicle modeling, the optimal characteristics of vehicle models, and protocols for creating “reduced models,” and the vehicles that should be modeled in the future. The discussion of future vehicle models reviewed the changing character of the vehicle fl eet noting the swings back and forth in vehicle size and weight. Proposed updates to the roadside hardware crashworthiness standards that are going through the approval process were developed, in part, because the vehicle types defi ned in NCHRP 350 are no longer produced or have been eclipsed by larger vehicles. 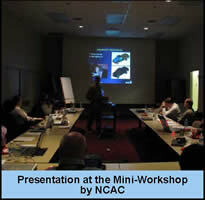 The ramifi cations of “microcars,” a possible emerging trend, were discussed. This mini-workshop was adjourned after about six hours to allow participants some extra time to get to the airport or on the road in the face of an intense snow storm. They did fi nd time, despite the snow, to take a tour of the Federal Outdoor Impact Lab (FOIL). Martin W. Hargrave, Office of Safety Research and Development, FHWA, Phone: (202) 493-3311 or Email: martin.hargrave@fhwa.dot.gov. 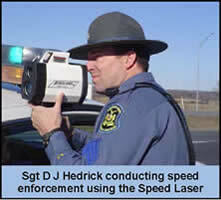 A U.S. scan will be conducted in Australia and Japan during February-March 2008 to collect information from overseas countries with the potential to improve roadway safety for older road users, and consequently all roadway users, in the U.S.
One of the Federal Highway Administration’s primary missions is to improve safety on the nation’s roadways. More than 42,000 people have been killed on American roads during each of the past eight years. While only one-quarter of all travel occurs at night, about half of the traffic fatalities occur during nighttime hours. To address this disparity, the FHWA has adopted new traffic sign retroreflectivity requirements that are included as Revision 2 of the 2003 MUTCD. To comply with the new requirements, public agencies will have until January 2012 to implement and then continue to use an assessment or management method that is designed to maintain traffic sign retroreflectivity at or above the minimum levels specifi ed. Public agencies will have until January 2015 to replace any regulatory, warning, or postmounted guide (except street name) signs and until January 2018 to replace any street name signs and overhead guide signs that are identifi ed by the assessment or management method as failing to meet the minimum retroreflectivity levels. Provided that an assessment or management method is being used, an agency would be in compliance with the requirements of the new provisions even if there are some individual signs that do not meet the minimum retroreflectivity levels at a particular point in time. Instead of using one or more of the fi ve assessment or management methods described above, agencies are also permitted to develop and use other methods based on engineering studies. 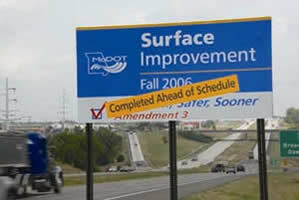 Because of the seven to 10-year compliance period that has been adopted for replacing signs that have insuffi cient retroreflectivity, highway departments will be able to implement improved sign inspection and management procedures and subsequently replace the signs in a time frame that is consistent with the typical sign replacement cycle. Cost increases from upgrading materials and/or processes might be offset by the longterm savings that result from the longer life of the higher performance sheeting products. For additional information on this rulemaking and sign retroreflectivity, please visit the FHWA retroreflectivity web site www.fhwa.dot.gov/retro. 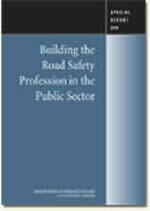 A Transportation Research Board (TRB) Special Committee for a Study of Supply and Demand for Highway Safety Professionals in the Public Sector has completed Special Report 289 (http://www.trb.org/news/blurb_detail.asp?id=8114) - Building the Road Safety Profession in the Public Sector. The report indicates that the lack of professional recognition and comprehensive road safety education and training opportunities threatens the ability of agencies to build the knowledgeable and skilled road safety workforce needed to make safety advances. To address this need, the report recommends that AASHTO & GHSA forge a broad-based alliance of public, private, and educational organizations to champion the road safety profession. For more information please contact Tom Menzies (tmenxies@nas.edu), TRB or Ben Gribbon, FHWA at: benjamin.gribbon@dot.gov. The Federal Highway Administration, Office of Safety Research & Development has just issued its latest 2007 Public Release (Version 4.00) of the Interactive Highway Safety Design Model (IHSDM). The software and its associated documents are now available for free downloading at www.ihsdm.org. The IHSDM is a suite of software analysis tools for evaluating safety and operational effects of geometric design decisions on two-lane rural highways. It currently includes fi ve evaluation modules, namely - Policy Review, Crash Prediction, Design Consistency, Intersection Review, and Traffic Analysis. Concurrent with the upcoming release of the Highway Safety Manual, we expect to release an expansion of the existing Crash Prediction Module, which currently addresses only two-lane rural highways. The expanded Crash Prediction Module will include the same capabilities for the evaluation of multi-lane rural highways and urban / suburban arterials that will be part of the Highway Safety Manual. To learn more about the IHSDM, please visit https://www.fhwa.dot.gov/research/tfhrc/projects/safety/comprehensive/ihsdm/. This 2007 release includes signifi cant enhancements to the Highway and Intersection Editors, user interface, evaluation process/wizard, output/reporting, help/documentation, the Administration Tool, and system confi guration. For free technical support, please e-mail IHSDM.Support@fhwa.dot.gov or call 202-493-3407. For more information, please contact Shyuan-Ren (Clayton) Chen, FHWA Office Safety R&D at 202-493-3054 or email clayton.chen@fhwa.dot.gov. The fi nal rule for maintained sign retroreflectivity was published in the Federal Register on Friday, December 21, 2007. The text of the fi nal rule went into effect on January 22, 2008. The FHWA Visibility website will be modifi ed to provide the text of the rule, the changes to the MUTCD text, a brochure that explains the changes, and other related items. Go to www.fhwa.dot.gov/retro. A 4-page brochure is in the process of being printed. Use the Safety Training Resource Database (STRD) (http://rspcb.safety.fhwa.dot.gov/) to search for safety and work zone professional development resources – both those that are currently offered and those that have been offered in the past. The STRD is a project of the Federal Highway Administration Office of Safety and an important tool offered by the Roadway Safety Professional Capacity Building Program (RSPCB). 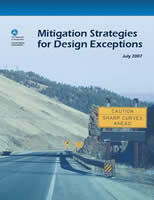 FHWA Office of Safety published Mitigation Strategies for Design Exceptions guide in July 2007. The purpose of the guide is to provide designers with practical information on design exceptions and strategies that can be implemented to mitigate their potential adverse impacts to highway safety and traffic operations. The guide presents and illustrates a variety of mitigation strategies, including real-world case studies from several States. Design criteria, established through years of practice and research, form the basis by which highway designers strive to balance cost, safety, mobility, social and environmental impacts, and the needs of a wide variety of roadway users. For many situations, there is suffi cient flexibility within the design criteria to achieve a balanced design and still meet minimum values. On occasion, designers encounter situations with especially diffi cult site constraints and an appropriate solution may suggest the use of design values or dimensions outside the normal range of practice. In such cases, a design exception may be considered. Designers should recognize, however, that design exceptions have the potential to negatively affect highway safety and traffic operations. For this reason, consideration of a design exception should be deliberative and thorough and a clear understanding of the potential negative impacts should be developed. Limited number of hard copies of the guide has been distributed to FHWA division offi ces, Resource Centers, and State DOTs. 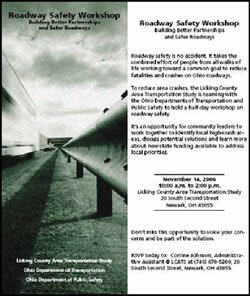 The HTML and PDF versions of the guide are available on the Offi ce of Safety website at: http://safety.fhwa.dot.gov/geometric/pubs/. FHWA is in the process of having more hard copies and CDs produced for further distribution upon request. For more information about the guide, please contact Ms. Guan Xu at: guan.xu@dot.gov. A new course is being offered by the National Highway Institute (NHI) entitled Advanced Work Zone Management and Design (FHWA-NHI-380072) This three-day training course provides participants with advanced levels of knowledge of, and competencies in technical and non-technical aspects of work zone traffic control practices, including work zone planning, design, project management, and contract issues. The course is designed to provide maximum flexibility by including core, recommended, and optional lessons. The default course consists of the core and recommended lessons. Each participant receives a copy of the Reference Manual and a Participant Workbook. The National Highway Traffic Safety Administration presents Traffic Records 101, an online curriculum for use by State and local traffi c safety professionals. This curriculum provides the basics, as well as an understanding of specifi c data components and technologies included in a comprehensive traffi c records system such as, crash, roadway, driver, vehicle, injury control, citation/ adjudication, motor carrier, exposure, and data analysis. Once registered, users are able to study at their own pace, complete interesting reading assignments that include links to applicable websites and articles, take rotating examinations on a wide variety of subjects, and track their assignments and scores. Additional resources are available on the Links and the Library pages of this site. Visit: http://www.trafficrecords101.net/ for more details.